Italian architect and art critic Bruno Zevi once pointed out the need to re-write the history of architecture from a spatial point of view. He described buildings as “great hollowed-out sculptures which man enters and apprehends by moving around within (them).” 1 He argued that working with a three-dimensional vocabulary, which includes people, was the specific property of architecture; a property that distinguished it from the visual arts. Today, more than fifty years later, multidisciplinary approaches in art have challenged architecture’s exclusive right to defining three-dimensional spaces. Thus it has become imperative for visual and performing artists, as well as curators, to create art experiences for specific sites. By exploring the concept of site-specificity, Space Invaders, Lehman College Art Gallery’s current exhibition, takes visitors on a trip through outer and inner space. Curated by Karin Bravin, these nineteen site-specific installations challenge their distinguished architectural host with a healthy debate on boundaries, aesthetics, and nature. 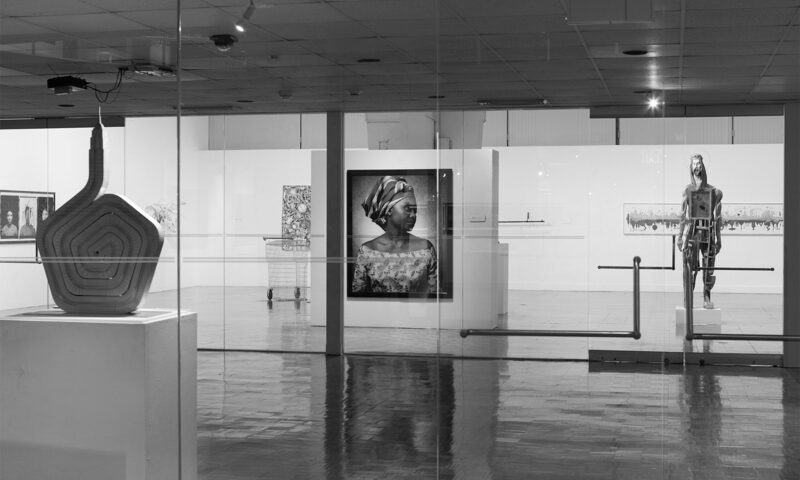 The gallery is located in Lehman College’s Fine Arts Building, and was designed by Hungarian architect Marcel Breuer, a much-admired professor of Zevi’s at Harvard University. Best known for his design of the Whitney Museum and the Wassily Chair, Breuer was a Modernist master and member of the Bauhaus. Built in 1960, Lehman’s Fine Arts’ Building is an example of Breuer’s venture in Brutalism, which is characterized by its poured concrete construction. The fine Arts Building is a box of dark-glass panels wrapping an undulating, light-concrete ceiling structure. Inside, six inverted pyramids of sharp, geometric edges –Breuer called them inverted umbrellas– drop down to meet six respective cross-shaped columns. Over time, the building has changed to meet the needs of the institution. Originally conceived as a continuous hall with few inner walls at ground level, it was modified in the eighties, as its function shifted from college library to gallery spaces and studio classrooms. While early visitors commented on its lit-from-within transparent beauty in the evening, the added walls broke up the building’s flow and created very unconventional, uneven spaces. The entrance lobby, however, still preserves Breuer’s intended transparency. Large glass windows on the two sides of the hall connect visitors with views from the outside. Artist Rachel Hayes’ Making the Modern banner-like structure of vibrant fabric stripes covers the window facing the campus. During the day the textile installation casts shades of colorful light through the fabric emulating stained glass. Hayes’ playful exploration of fabric textures, surfaces, and colors is a constant in her work and is also present in Burlap Falls, her second piece located within the larger gallery. Across the hall on the other window of the entrance, is Kim Beck’s Lot (2012). Stylized, vinyl silhouettes of plants resembling long-abandoned weeds climb across the windowpane. In different tones of green, they become an extension of the verdant, but carefully tamed garden outside. Lot flourishes beyond the window, creeping over the walls, corners and doorways leading to the central foyer and large ceiling support column. Beck’s weeds connect the “overgrown” walls with the outside environment, as if the building itself was flipped inside out. The foyer is both the antechamber to the gallery spaces, and a resting place from which the monumental column expands towards the ceiling and soars over our heads. It is aligned with a second column inside the largest gallery space, and several works in Space Invaders use these columns as their points of departure. This is the case for Sheila Pepe, whose Fancy Dress for Marcel’s Concrete (2012) directly addresses and incorporates the architecture and Breuer-designed furniture of the building. A net of black shoelaces and rubber strips hangs from the balcony of the second floor offices, and wraps around Breuer’s central column. The title and technique, which is traditionally associated with women’s fashion, as well as its resemblance to a humongous spider web, suggest a certain irony when contrasted with the clean and imposing modern surfaces of the concrete, commonly associated with masculinity. In Hercules Lite (2012), on the other hand, Carol Salmanson employs industrially manufactured transparent green acrylic panels to recreate the cross shape of the columns. They come out of the four sides of a thin metal pole that joins the gallery’s glass walls, giving continuity to the space. As their edges absorb and reflect the light around them, mirroring the actual architecture, they become a ghostly yet playful presence. Heeseop Yoon approaches cluttered, baroque spaces such as basements, old studios or storage spaces, where objects accumulate arbitrarily with the passage of time. She focuses on the absence of humans, which grants these spaces an extemporal quality. In her process, Yoon projects her photographs on the wall and then draws, freehand, using black masking tape on mylar panels, which she later pieces together. Even if not directly connected to the graffiti tradition, there is certain visual rebelliousness in Yoon’s aesthetics in the way her work takes over a corner of the gallery and climbs into areas that are normally overlooked as exhibition space. Yoon’s flat, high-contrast images in black and white find a good visual complement in The Seepage of Proserpine (2012), by Lisa Kellner, which is placed right next to it. Kellner’s structures grow out from the wall and the ceiling to gather into organic amorphous shapes, made out of silk organza. In their grouping, these pinkish, round forms, resemble colonies of cells—the artist has mentioned their connection to arthritis cells in the human body. They have undergone a labor-intensive process that spans from dying the white fabric to being cooked in the oven and immersed in compost, in order to acquire the final desired patina, but also, conceptually, to connect to her broader quest on decaying biological systems. Because of its transparency, the silk organza creates interesting shades on the wall behind the piece. Some of the works focus on the materials themselves as another way to flirt with the architectural frame where they have been conceived. Mariah Robertson’s 120-feet roll of photographic paper, for instance, is both support and installation material itself. It goes up into the air and crosses over the visitor’s passage between the column and the glass wall, to meet the ceiling at the balcony’s level, and then drops down again. The artist manipulates the printing process by hand, controlling the temperature of the chemicals used, often taking advantage of the properties of certain objects, such as translucent stones, to reach desired colors and patterns. However, pieces such as Abigail DeVille’s relate to specific narratives that serve as a background to connect the viewer with the venue itself and its history. In the case of this artist, it passes through personal experiences. DeVille recreates aspects of her family’s life in the Bronx; especially connected to her recently deceased grandmother. Her Harlem River Blues (2012) is a room filled with personal objects that belonged to her dear relative and indicate the passing and erosion of time –an old, discontinued TV, her father’s armchair as a child, and the paint-by-numbers pictures and vinyl LPs of her grandmother coexist with plastic cockroaches and random debris. The dim light, the blue shredded paper and the wooden triangular structures that point out to the middle of the space help to create a dramatic atmosphere for this room. Layman (2012), by Godfrey is located in one of the building’s openings to the landscape and transforms the way the heavy concrete walls frame our view to the outside. Different size cylinders of thick Corten steel are stacked together from floor to ceiling. Fairly exposed to the elements, they have acquired a rusty patina of subtle red and blue tones, which transform the light when looking through them. One of the cylinders is big enough to allow visitors to walk through it, and enjoy the perspective from the other side. In an interview, Godfrey commented about the process of creating this work: “[It] is not dissimilar from building a woodpile or a stacked-stone fence […] Your first priority is to make sure it is stable, doesn’t fall down and functions the way you want […] The art is not entirely separate from the engineering […] it’s all about how the cylinders relate to the mass, their adjacencies and the supports. ” 3 This statement could have been another solid argument for Bruno Zevi’s revising his idea about the distinguishing elements in architecture. After visiting Karin Bravin’s Space Invaders, the Italian architect might have visualized Lehman College Art Gallery’s spaces from a completely different perspective. More than referring to the effects of its modern aesthetic on people, he could have discussed the baroque aspect of discovering new dimensions –materials, angles, heights and views– as one moves through the building. But better not to write it in stone –or in the building’s concrete. In another fifty years, who knows what future generations will say about architecture and site specific art.